While fraud is a well-known issue for foreign investors doing business in China, many companies underestimate the risks of fraud occurring from within their own organizations. The answer to limiting exposure to these risks is internal control. 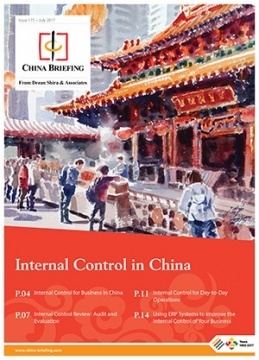 In this issue of China Briefing magazine, we explain what makes China’s internal control environment distinct, and why China-based operations need to prioritize internal control. We then outline how to execute an internal control review to gauge organizational resiliency and identify gaps in control points, and introduce practical internal controls for day-to-day operations. Finally, we explore why ERP systems are becoming increasingly integral to companies’ internal control regimes. Experienced investors in China have invariably encountered instances of fraud. In 2016 alone, China’s fraud market was worth an estimated RMB 100 billion – about US$14.8 billion – according to government statistics. However, while fraud is a well-known issue for foreign investors doing business in China, many companies underestimate the risks of fraud occurring from within their own organizations. Cultural differences and language barriers frequently cause misunderstandings and lapses in operational protocols, especially when senior managers are based overseas. Other times, the threats are more malicious, with opportunistic employees taking advantage of an unstructured business environment for their own gain. The answer to limiting exposure to these risks is internal control. Internal controls are processes implemented by an organization to limit the potential for mismanagement and increase operational efficiency. These processes range from checks and balances to ensure no single employee has too much authority within a company, to establishing best practices for business activities at all levels of an organization.